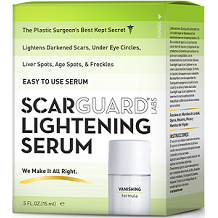 Scarguard Labs Lightening Serum Review - Does it Actually Work? In the article below, we are reviewing a scar tissue repair product called Scarguard Labs Lightening Serum. The maker’s of this product claim that the rapidly absorbed gel will lighten the appearance of dark brown scars and other skin discolorations. It is not designed to be used on other types of scars. Hydroquinone is effectively a skin bleach, and has been proven to lighten dark scars. Hydroquinone, was declared safe for use by the US Food and Drug Administration in 1982, but question marks about its safety remain. It was found that many of these products were laced with mercury. The FDA allows hydroquinone to be sold without a prescription but only in 2% concentrations. The rest of the ingredients in Scarguard Lightening Serum are a combination of dermatological and homeopathic ingredients that are said to work together to lighten dark brown scars and other skin discolorations. Apply a small amount of the product on to the affected area twice daily and gently rub it into the scar tissue. Consult a doctor before using. Do not apply to mucous membranes. When using this product, minor irritation may occur; avoid contact with eyes. If contact occurs, rinse with water. Stop use and ask a doctor if irritation occurs. Limit sun exposure and use a sunscreen, a sun blocking agent or protective clothing to cover bleached skin when using and after using this product in order to prevent darkening from reoccurring. You can purchase it directly from the manufacturer for $34.99. Shipping is extra. When we checked, the product was out of stock on the company website. There are no new customer incentives nor bulk buying discounts. If you are dissatisfied with the product, you can return it within 90 days for a full refund. However, if you purchased it from another online retailer, Scarguard Labs will not refund your money. Opened bottles are not included in the refund policy. We were pleased with a number of aspects of this scar tissue supplement. Hydroquinone, the active ingredient in Scarguard Labs’ Lightening Serum has been clinically proven to lighten dark skin discoloration. There is a 90 day guarantee and return policy. We do have our concerns however. Although potentially effective, we are concerned about the potentially health hazards associated with hydroquinone. 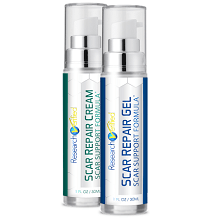 This product does not have FDA certification as a scar remedy nor is it certified organic. This is an expensive product to buy, shipping is extra and there are no new customer incentives nor bulk buying discounts. The guarantee does not allow for the return of opened bottles of the product. We do have concerns about possible side effects like sun damage to treated scars when using this product. For all these reasons we cannot recommend this product for treating your scar tissue.